Waikoloa Colony Villas 1004. Perfect two bedroom condo for your vacation! Location is everything on vacation, and Waikoloa Beach Colony Villas are conveniently located on Hawaii’s Kohala Coast with Big Island’s best beaches and sunny weather. 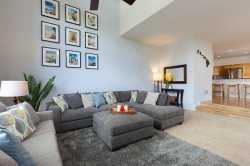 The condo is located in a private and gated community in the exclusive Waikoloa Beach Resort and features two bedroom suites, two full plus one half bathrooms and comfortably accommodates up to six guests. Set among 22 acres of tropical landscaping and palm trees, and is right next to the 10th fairway of the Waikoloa Beach Golf Course. You can also play tennis or workout in the fitness rooms. There are two swimming pools; one pool feature a lava rock waterfall and Jacuzzi and the other pool has a separate 18' deep children's area. Every guest can sit back and enjoy their time together in this magnificent modern home that is impeccably maintained and decorated with custom paint and finishes throughout. A spacious and modern comes fully-equipped and features modern all-electrical appliances and a breakfast bar with seats for three. The indoor dining seats six and the outdoor dining seats four, and there are BBQ grills located at both pools. Open and inviting, the kitchen flows into the living room making entertaining a breeze. Central air conditioning and ceiling fans throughout your home helps create a comfortable living environment. The living room offers a 52 inch TV with cable! The master suite offers a king-sized comfortable bed, with 42 inch TV (no cable) but DVR player and smart TV for those with a Netflix account. Also a private balcony, and a deep soaking bathtub and a separate walk-in shower. The guest suite offers a queen-size bed with a 32 inch TV (no cable) but DVR player for watching movies. There is a sofa sleeper to comfortably sleep up to six guests. There is also a full-sized washer and dryer. Super nice unit - much nicer than a previous unit we stayed at earlier in the year through another service on this same property. We loved it. See comments, #14.